LINDSY SAYS Releases Debut Video For "Hold On Me"
Savannah, GA hard rockers LINDSY SAYS released their first video for their upcoming debut single, "Hold On Me" today, and you can check it out now on KNAC.COM HERE. LINDSY SAYS, the brainchild of frontman Jared Matthew, initially came together in 2015 and last year morphed into their current lineup (consisting of guitarist, Dustin Kiernan, bassist, Zack Joy, and drummer, Jonathan Parker). "Hold On Me" comes from the band's self titled debut album produced by Rusty Wilmot in Orlando, FL due out later this summer. 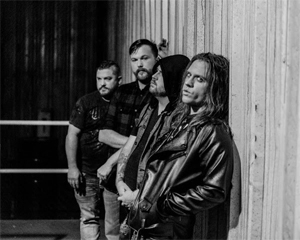 The band evenly balances all ten songs between old school melodic metal and new modern rock, with a focus on strong vocal performance laced with infectious melodies. "We are all big fans of the 80s and respect what was created in that time period, but we do not say we are an 80 s band - we are straight ahead rock n roll. At the end of the day music is music and we just want to rock with everyone," says Jared. The band will be announcing dates in support of Lindsy Says soon.